Update: March 9, 2019: Victory! Bill signed into law, making MA the 16th state to ban Conversion Therapy. GLAD Senior Staff Attorney Ben Klein’s statement can be read here. 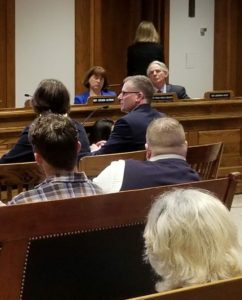 March 5, 2019: GLAD Senior Staff Attorney Ben Klein submitted testimony on behalf of GLAD in support of H. 140 An Act Relative to Abusive Practices to Change Sexual Orientation and Gender Identity in Minors to the Massachusetts Joint Committee on Children, Families, and Persons with Disabilities. Read it here. August 1, 2018: The MA Senate did not take up this bill in time for the close of session. June 27, 2018: The MA House voted 137-13 to ban the discredited practice of conversion therapy on youth across the state. The bill now heads to the Senate. The conversion therapy ban bill, An Act Relative to Abusive Practices to Change Sexual Orientation and Gender Identity in Minors (House Bill H.1190 and Senate Bill S.62) had a public hearing in the Joint Committee on Children, Families, and Persons with Disabilities on June 6, 2017. GLAD Senior Attorney Ben Klein testifying in support of the ban. Read testimony in support of the ban from GLAD Senior Attorney Ben Klein. Everyone from the American Psychiatric Association to the American Academy of Pediatrics agrees that seeking to change a minor’s sexual orientation or gender identity is not only ineffective, but dangerous. Efforts are underway across the country to end the discredited practice. Thirteen states including four in New England – Vermont, Connecticut, Rhode Island, and New Hampshire – have passed laws preventing the use of conversion therapy with minors. GLAD is part of the coalition working to make Massachusetts the next state to protect LGBTQ youth from this harmful practice and send them a message that they are perfectly okay.